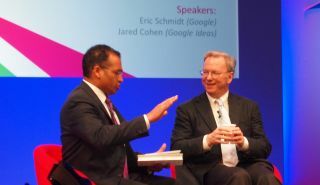 Google's Eric Schmidt says the internet giant has "a clear business incentive" to protect your privacy. Speaking at Google's Big Tent UK event this week he was at pains to state why it's in Google's interests to respect data. "We try to be as transparent as possible on what we do with people's data. From our perspective, we disclose what we are doing. So we basically made a broad statement of 'this is what we do with your data' – we did this about a year ago and it was widely covered. "Anybody who cares about privacy would have read this and understood it and knew what we were doing. From our perspective we had disclosed what we were doing." But Schmidt acknowledged the continuing concerns over Google's data use, before moving on to the reasons why he believes such concerns are unfounded. "My interpretation is that there is concern that we might be misusing this data and we're not telling you [about it], which I assure you is not the case. We're very committed to telling you what we do. There appears to be a separate concern that we use the data at all, but that's how our systems work, that's how we are able to afford the data centres and the services that are free. "So we're sort of caught between these rhetorical points. But I can assure you from a privacy perspective – if we were to violate your privacy in a way that was material we would lose you and we would not get you back." "We would get sued to death"
And Schmidt says you should believe in Google's good intentions even if you don't like the company. "Independent of whether you like us, we have a clear business incentive to protect your privacy. Because if we violate it, we will lose you. Furthermore, if we do it, the Europeans and US will legislate against us, restrict our actions. So there are many reasons why you should think your privacy is protected. "We say it, we do it, we suffer a penalty if we break it, we lose you as a customer, we will get regulated and we will get sued to death, because we get sued over everything. I think that's roughly how it's going to play out. If people are genuinely concerned, we need to fight for our privacy because it will get taken from us – not from Google, but from others who have other agendas." Talking more generally about the concept of privacy – tackled in his new book – Schmidt said it was more important than ever that we all work to protect our own privacy. "It's difficult to separate privacy and security. For example, everyone expects Google to respect the integrity of the data you give to Google. It would be a huge problem if your information is somehow leaked or given to Governments. That makes sense to me. "I think you have a responsibility for judgement; the internet has retention. It's difficult to delete things. If you post things, they're unlikely to be deletable. This is a problem for parents. Schmidt cited the recent examples of 3D printed guns and ammunition being made as a reason why information online is so indelible. Referring to a specific US case he said: "This information is now all around the world and is essentially undeletable because it's in so many different places. People will die because of what this gentleman – and I call him that with derision – decided was a clever idea." Schmidt is clearly forthright on the issue of privacy and says he has long thought about the implications of putting ever-increasing amounts of data online: "We need to fight for privacy now, or we're going to lose it," is his advice for us.